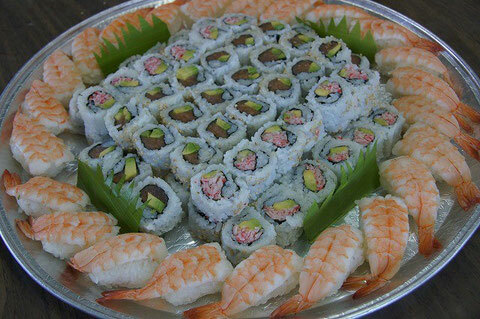 Best Sushi is always the one which is made in the middle way. Rice is not too much and yet not too less. It should be also not too soft and not too hard. Vinegar is also not too much and not too less. If everything can be well-balanced in the middle way, and then that could be the Best Sushi in the world. One of my Sushi Masters used to tell me all the time, "If you put too less rice, the customer would complain it. If you put too much rice, we will lose our money (profit)." During our new year's party, I received some good comments about my sushi. But I can not be sartisfied with good comments since I want improvement. 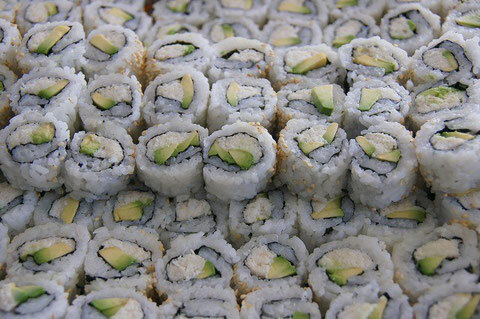 I will continue to pursue my best sushi...for the refreshments after the service. Please come to try Sushi...next time... on Sunday, February 24 at 10:30 a.m. We have a Nirvana Day Service here at Koloa Jodo Mission. Hope to see you here.